Easy meatball recipe that can cook in the slow cooker, while you take care of other business. To get ready for the freezer, add the meatballs, onions and sauce to the baggie or container. Then you can add the meatballs and sauce to the slow cooker and let them slow cook themselves to perfection! Serve with a side of pasta and salad for delicious, easy weeknight supper! Enjoy! To the slow cooker, add the precooked meatballs and chopped onion. Pour the beef broth and marinara sauce around the meatballs. Prepare the pasta, just before serving. 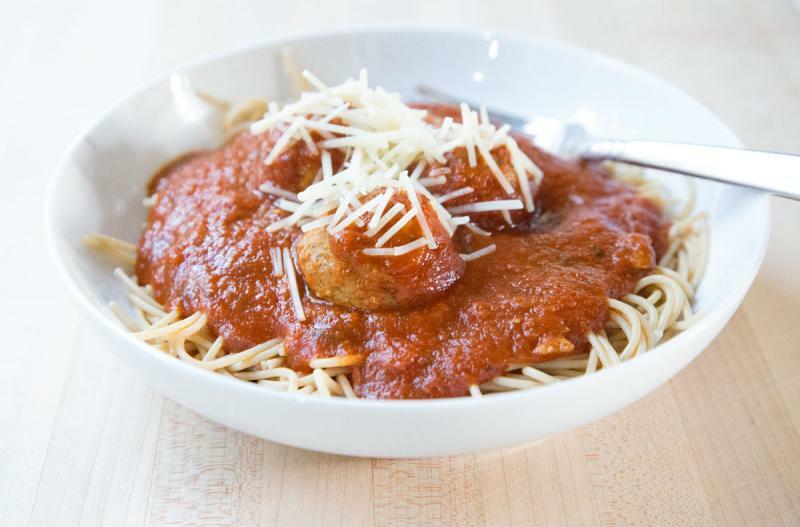 Serve Slow Cooker Meatballs with Spaghetti and salad. Put baggie in the freezer and freeze up to 6 months in fridge freezer or 12 months in a deep freezer. Thaw in the fridge overnight, or a warm bowl of water for about 20 minutes. Add the beef broth into the base of the slow cooker, then add the meatballs and sauce. Set on low and cook for 4 hours. Recipe is dairy-free when served with dairy-free sides and no cheese garnish. Recipe is gluten-free if the pre-made meatballs are gluten-free and served with gluten-free pasta. Thaw and add beef broth to base of slow cooker. Add meatballs and sauce, then cook on low for 4 hours. Serve over spaghetti with salad.